When she’s not working with big names like Lupita Nyong’o, Constance Wu, and Diane Kruger or writing a best-selling book, celebrity stylist Micaela Erlanger divulges her fashion expertise in our Ask a Stylist column. From the best places to source vintage to the secret to finding your most flattering jeans, come back each week for a professional’s perspective. Accessorizing with costume jewelry is one of the best styling tricks in the book. Throw on a pair of crystal chandelier-style earrings, and your outfit instantly looks 10 times cooler. Wear a stack of colorful bracelets, and your basic look is suddenly ready for an Instagram. The easy add-on never fails. Okay, I take that back. There’s one detail that can quickly take your costume-jewelry moment from covetable to, well, not. With colored stones, if the foil backing is exposed, this can make your jewelry look cheaper. You want to find pieces that look clear and sparkly rather than dull and obvious from the inexpensive foiling. BaubleBar and Swarovski are two of my go-to brands for affordable costume jewelry that doesn’t look the slightest bit cheap. Shop my favorite non-foil-backed earrings, necklaces, rings, and more below. Not your average gold hoops. Wear these with a simple slip dress. This dainty choker makes for a pretty everyday necklace. Add this to your layered-necklace collection. This little guy is one of Revolve's best sellers. A pre-made stack makes it all easy. The chandelier earring trend is still going strong. Sold as a set but I'm into the idea of wearing the rings separately. Wear these with your hair up. 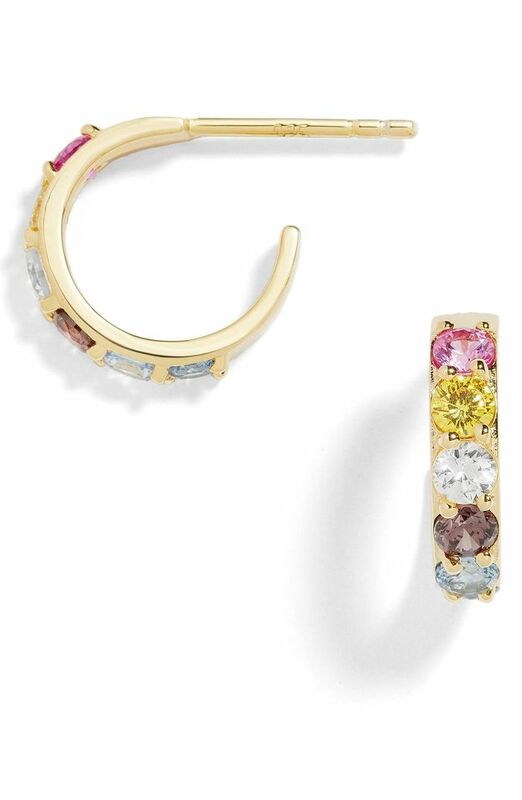 Swap your simple gold hoops for these pretty ones. A neutral take on the crystal trend. For the shopper looking for something pretty and pink. Perfect for your next weekend look. The 2019 version of a friendship bracelet. You can't go wrong with this delicate chain bracelet. Up next, shop the eight designer bags to tell all your friends about this season.